Okinawa is an island south of the main Japanese islands that can reached by plane or a 25 hour ferry ride from Kagoshima on southern Kyushu. It is known for its warm climate, coral reefs and emerald water. Japan's 47th and poorest prefecture, Okinawa is an odd mix of American military bases, Japanese resort hotels, local island culture, pineapple plantations, and towns with pachinko parlors and girlie bars. About 1.3 million people live on Okinawa. The majority of 5 million or so visitors that come annually to the island are Japanese, although more and more Taiwanese, Koreans, and Chinese are starting to come. Accommodation, food and taxis are considerably cheaper than on the main islands of Japan. Okinawa includes the 454-square-mile main island of Okinawa and 160 smaller islands, including Ie, Iheya, Izena, Kerama, Kudaka and Kume Islands. A total of 117 of these islands are uninhabited. The Okinawa chain of islands stretches for 700 miles between Taiwan and the Japanese island of Kyushu and are scattered over an expanse of sea that measures 250 miles from north to south and 600 miles from east to west. The highest point on the rugged jungle-covered interior of the main island is 1,600 feet. The islands lie right in the heart of the typhoon belt and are frequency hit by fierce storms and high humidity from June to November. The spring and fall are the best times to visit. Winters are mild but the sea is little too chilly for swimming. In the early 1400s, the warring chieftains on the islands south of Japan were unified under a single king that established the Ryukyu Kingdom, a seafaring state that traded silk, spices, clothe, swords and horses with China, Korea, Sumatra, Malacca, Siam and Japan. It's culture was influenced by Southeast Asia and particularly by China, which extended cultural and economic hegemony over the islands and legitimized the rule of the Ryukyu kings. Confucianism, Buddhism and Chinese art intermingled with the island indigenous animist beliefs and folk art. In 1609, a feudal clan from the southern Japanese island of Kyushu invaded Okinawa and defeated the Ryukyu kingdom. The kingdom endured for another 270 years as vassal state of Japan whose subjects were not allowed to speak Japanese or wear Japanese clothes and were sometimes displayed in court ceremonies as if they were wild animals. In 1879, Okinawa was annexed by Japan and made into a Japanese prefecture and Okinawans were assimilated into Emperor-worshiping Japanese culture. Over the years the Japanese have tried to suppress the cultural identity of the Okinawans. Okinawa was controlled by the U.S. after the war. Some of the islands were given back to Japan in 1968, and the rest were returned in 1972. At one time the U.S. maintained 88 bases and 44,000 troops on Okinawa. The bases were used as supply and staging areas in the Korean and Vietnam wars. Today there are about 30,000 troops on Okinawa. They are not well liked but the Okinawan economy would suffer greatly if they left. On May 15 1972, the United States returned Okinawa to Japan under Eisaku Sato (1901-1975) who was one of postwar Japan's longest serving prime ministers. He served as prime minster from 1964 to 1972 and won the Nobel Peace Prize in 1974 for his work improving relation between Asian countries and getting nuclear weapons removed from U.S. bases in Okinawa. Documents revealed in 2008 indicate that Sato made a secret deal with U.S. President Richard Nixon, negotiated by Henry Kissinger, in which the United States agreed to return Okinawa to Japan in return for being allowed to keep nuclear weapons on Japanese soil in Okinawa in the case of an emergency. This agreement, which was reportedly signed in a small room off of the Oval office in the White House, contradicted a 1967 Japanese declaration which stated that no nuclear weapons would be brought into Japan and a 1969 agreement between Japan and the United States that called for the removal of all nuclear weapons from Okinawa. The Okinawans are regarded as warm, friendly, fun-loving people. They are considered somewhat eccentric by other Japanese. When one Okinawan man was asked by National Geographic reporter Arthur Zich what the difference between Japanese and Okinawans were, the man said, "The heart. Ninjo---human feeling. Up there it's cold. In Okinawa it's warm! Like our sun!" The Japanese tried to suppress the cultural identity of the Okinawans. After World War II there was a rebirth of Okinawan culture, including a renewed interest in the Okinawan language, arts and rituals such as the elegant Yotsudake dance, dragon boat racing and the spring festival on Henza in which men dress like robots, women, and Polynesians to bring plentiful fishing. The concentrations of people over 100 on Okinawa is five times higher than the rest of Japan. As of 2005, there were more than 700 people in Okinawa who were 100 year or older---about 86 percent of them women. The oldest man on both Japan and Okinawa, 108-year-old Genkan Tonaki, only recently gave up proposing to nurses. He worked in sugar cane fields until he retired at the age of 85 and used to drink six bottles of beer a day. Heart disease, strokes, dementia, clogged arteries, and high cholesterol are rare. Cancer rates, are low. Okinawans suffer 80 percent fewer heart attacks than North Americans, and are twice as likely to survive if they have one. They have a forth of the breast cancer and prostate cancer rates and a third less dementia than Americans. There has traditionally been little obesity in Okinawa and old people have stronger-the-expected bones. One Okinawan proverb goes: “At 70 you are but a children at 80 you are merely a youth, and at 90 if the ancestor invite you into heaven, ask them to wait until you are 100, and then you might consider it”. The extraordinary longevity of Okinawans has been attributed to an active social life, low stress levels, a strong sense of community, lots of exercise, respect for older people, moai (traditional support networks), remaining involved, having a strong sense of purpose, working into the 80s or 90s, and having a lust for life summed up by the expression “that which makes one’s life worth living.” Some individual Okinawans credit their longevity to drinking a mixture of garlic, honey, turmeric, aloe and awamori liquor before they go to bed. The traditional Okinawan protein- and mineral-rich, plant-based diet is also regarded as important factor in extending the life span of Okinawans. The traditional Okinawan diet is very low in calories, low in salt, but high in nutrition, flavinoids and anti-oxidants. 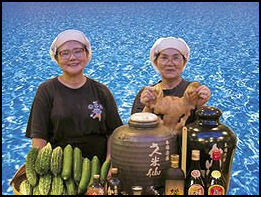 Okinawans eat a wide variety of plants, especially green-yellow vegetables and soy products. Okinawans consume 60 to 120 grams of soy products a day, more than any other people on Earth. Okinawans practice hara hara bu (only eating until they are 80 percent full). The average intake of calories for elderly Okinawans is only 1800 per day compared to 2,500 a day for the average Western male. Their body mass index (BMI) ranges between 18 and 22, with 23 and below regarded as lean. Okinawan foods which are said to contribute to a long life are sweet potatoes, which used to be a staple of the Okinawan diet; nabera, a cucumber-like gourd; snake gourds, mozuka (seaweed); uuchin; a kind of ginger; umjanbaa, a leafy vegetable rich in vitamins and minerals; tumeric, Chinese radishes, Okinawan shallots and mugwort. Goya, a bitter-flavored Okinawan vegetable resembling a zucchini with warts, is particularly valued as a health food. It has twice the vitamin C of lemons and is said to contain anti-aging agents for the skin. With all this said, the health of Okinawans is declining. Okinawans are now the fattest people in Japan and men 55 and younger have the highest relative mortality rate in the country. The decline has been attributed to lifestyle and dietary changes. Genetics seems to have relatively little bearing on health. When Okinawans grow up in other countries there disease and health problems are more reflective of their adopted country than their homeland. As Okinawans have adopted a more American-style diet, their rates of cancer and heart disease have climbed. Book: The Okinawan Program (2001),a New York Times bestseller, and The Okinawan Diet Plan: Get Leaner, Live Longer and Never Feel Hungry (2004) by D. Craig Wilcox, Bradley Wilcox and Makato Suzuki. Okinawan is regarded as dialect of Japanese. Linguists recognize five separate languages within the 200-island Ryukyu archipelago. They are related to but distinct from Japanese. Local Okinawan religion is presided over by women and incorporates elements of shamanism and animism. Okinawa is the home of noseless yuta shaman. The defect is interpreted as a kind of stigmata. Okinawa is dotted with traditional turtle-back tombs, which are regarded with such reverence that sometimes more money is spent on them than a house. If a boy asks a girl to visit the family tomb it is considered a marriage proposal. The most important festival on Okinawa is Obon, a time of the year when Okinawans believe the spirits of their ancestors return to their old homes for three days. Ancestors are honored with prayers and the burning of paper money before an altar at midnight. When its time for the spirits to go they are ushered out with sticks of sugarcane. One woman told Zich, "We believe or ancestral spirits really do come back to visit. We worship them. But nobody had ever died and come back to tell us what it's like, so we don't know for sure." Women play a prominent role in Okinawan society. Chichi Jima (one the Ogasawara Islands) is home to a handful of Japanese with European features. Descendants of whalers and adventurers who came to the island in the 19th century and married local Polynesian and Japanese women, they have names like Washington, Savory and Gonzalez and speak a language that mixes Japanese, English, Polynesian and Melanesian words. Chichi became an important whaling station in the early 19th century after good supplies of freshwater were discovered there.. Among this that stopped here were Commodore Matthew Perry and the writer Jack London. In 1944, former U.S. President George Bush, then a 20-year-old pilot, was shot down offshore and rescued by a submarine. During World War II, there were reports of cannibalism taking place here. The traditional Okinawan diet is credited with making Okinawans live a long time (See Above). Younger people are eating a fattier diet. Typical Okinawan dishes include: champuru (stir-fry), stir-fried papaya with carrots, rice and wakame (soft seaweed) and tonjiru (soup with pork and vegetables). Spam was introduced by American soldiers. It became a cheap source of meat and even today it is sold at restaurants prepared in a number of different ways. American have also introduced another foods. Some of which have been adapted to local tastes like taco rice. Goat meat is very popular in Okinawa. It is cut raw from a flab of meat and consumed with beer as sashimi and is also stir fried and made into yagi-jiru goat soup. It has traditionally been eaten at celebratory events such as a housewarming or births of new baby. It has also been eaten as a remedy for overcoming fatigue from a hard day of cutting sugar cane. Consumption is declining as young people regard it as a food of the older generation. Goat meat used to be a staple of the Okinawan diet---with goat broth a favorite at Okinawan festivals--- but consumption has fallen off as Okinawans have begun eating a broader range of foods. Alarmed by this the prefectural government has begun promoting the meat as tasty and nutritious, introduced goat meat dishes and encouraged farmer to raise goats. Okinawa is still regarded as a major center of traditional crafts. Among the crafts that are made here are weaving lacquerware, dyed garments, ceramics, and stonework. Traditional Okinawan crafts include Bingata (Okinawan dyed textiles), yachimum (ceramics) and Ryukyuan lacqueware. Okinawa is famous for its shisha ornaments. Found in lines on rooftops and in front of homes and stores and on mailboxes, these lion-dogs have bug eyes, wagging tongues and crazed expressions. Regarded as guardian spirits, they are usually positioned facing the road to protect a house from evil spirits. sometimes they are positioned facing to the south to ward off fires and towards the northeast to keep away spirts that fly in on the wind. Shisas are about the size of a small dog, They are made from clay and shaped by hand with bamboo tools. Their eyes are usually shaped last. A cup of sake and salt are placed before the kiln before it is fired up and the “birth” is treated as an important event. A skilled shisa maker requires about six days to make a 50-centimeter-high statue from a mixture of red and gray clay and allows it dry about two weeks before placing it in a kiln that is heated up for five days with wood before it ready. Shisas used be found almost exclusively on tiled roof tops but after tile roofs became less common they were placed on gateposts and in alcoves. Some people believe that the best Japanese music comes from Okinawa, which boasts massed paranku choruses of drummers, dancers and singers, and folk groups and popular artists who use modern instruments and traditional instruments like sanshin (a three-string Okinawan banjo that gave birth to the samisen). Okinawan shima uta ("music of the islands") grew out of traditional shaman rituals and varies somewhat from island to island. Rinsho Kadekarau is considered the "Godfather of Shima Uta." He died in 2000. Choki Fukuhara is considered the first major figure of modern shima uta . He founded Marafuku, Okinawa's most important local record label. His son Tsueno Fukuhara is one of Okinawa's most popular artists and important song writers. The Hoptones are a male vocal quartet that have been a local institution since 1966. They do pop-style versions of Okinawan songs, many composed by Tsuneo Fukuhara. Yasukatsu Ohshima is highly regarded as the greatest vocalist of the older generation. Misako Oshiro is highly regarded as the best of the younger generation or traditional music. Sadao China established the trend in the 1970s of mixing Okinawan music with Western forms such as reggae. He recorded the well-received alum Koza Dahasa with Ry Cooder on slide guitar, David Hildago on accordion and Jim Keltner on drums. Shoukichi Kina also blended Western and Okinawan styles and worked with Ry Cooder as well as Haroumi Hosono. The Rinken Band is one Okinawa's most popular and critically acclaimed groups. Founded in 1977, the group blends pop music and traditional Okinawan instruments and have helped revive the traditional music of the Ryuku islands. They have record 11 CDs. Their first hit, Arigato (1985) was followed by a string of hits in Japan. The Rinken band is named after its founder Teruya Rinken. The group has eight members, including singer Tomoko Uehara (Rinken's wife), a samisen player, and a samba player and powerful rhythm section. In their live shows they appear in colorful costumes and perform traditional eisa dancing. Other highly-regarded Okinawan artists include Begin, Champloose, and Nenez. Filmmaker Yuji Nakae has made good films about Okinawan life including Nabbie’s Love (1999) and Hotel Hibiscus (2003). Okinawa has its own form of national theater---kumidori---a noh-like all-male dance drama performed without masks. Regarded as more slow-moving than noh or kabuki, it revolves around stories of unrequited love and Confucian values and is performed to the rhythm of hyoshigi clappers and music from a three-stringed samisen, a koto, bamboo flutes, kokyu fiddle and odaika and shimedaiko drums, Many pieces are written by Chokum Tamagusuky (1684-1734), an official in the Ryukyu kingdom who wrote the pieces with the purpose of entertain Chinese envoys to the islands. So what made this gotochi hero so successful--- Ryujin Mabuyer hails from Niraikanai, which means utopia in the Okinawan language. His first name, Ryujin, refers to the god of the mythological Ryukyu Kingdom of Okinawa and his surname, Mabuyer, means "soul" in the local dialect. The TV program, named after its leading hero, was first aired in Okinawa in October 2008 by RBC based in Naha. It features a timid young man who discovers that the soul of the ryujin resides within him. Mabuyer fights against the Majimun, a vicious corps trying to collect the legendary Mabui (soul) Stones that contain Okinawan souls, such as the one named "Nuchi du Takara" (Life is a treasure). He is joined by sidekick Ryujin Ganasea, who represents a dragon god. The program became so popular that it is now syndicated nationally. It has aired for three series and hit a record high viewing rate of 17.6 percent. The underlying spirit of these heroes is based on traditional Okinawan values, which involves thinking beyond the conventions of right and wrong, to instead prioritize forgiveness by making peace with, rather than thoroughly defeating, the enemy. The characters speak with an Okinawan dialect that features words which are sometimes totally foreign, even to local children. But when children are taught the meaning of these words by their parents or grandparents, the program becomes a vehicle that enables different generations to share ideas and communicate. Another reason for the program's success is the business plan made by Koyano and others working on the show. Mabuyer was created to act as an icon for Okinawa that could sell souvenirs and promote the prefecture. Once Mabuyer became popular, merchandise that referenced the show was sold. This included passenger planes with Mabuyer printed on the fuselage and bank deposits named after Mabuyer. The program was first broadcast outside the prefecture in 2009 and it is now being aired at 6:30 p.m. each Saturday by Tokyo MX TV. and at midnight on Friday by STB based in Sapporo. The show features subtitles in standard Japanese to cater to viewers who do not understand the Okinawan dialect. The character's popularity has been increasing, with merchandise selling well. Mabuyer is the lead character in the film Ryujin Mabuyer THE MOVIE--Nanatsu no Mabui," which was released in January. The next step is to promote the character globally. The show has already achieved limited international success through its syndication on Hawaiian TV. "We're thinking of selling the program's storyline in the hope that Mabuyer provides the model for each country to produce its own original gotochi heroes," Koyano said. Okinawans believe that clothing surrounds the spirit and keeps it from escaping from the body. Some Okinawan cloth and garments are extraordinarily beautiful. The best weavers have been designated National Treasures of Japan. Silk and cotton were not introduced until the 16th century. The upper class have traditionally worn ramie cloth (see below) and the lower classes wore banana fiber fabric (see below). Clothes made from these crisp, breathable fabrics are valued even today for cool garments worn in the summer. In the Ishigakijima Islands, clothe is made from a kind of flax called chima and died with kuru, a yam-like plant. Yomitanzan Hanaori is a special fabric that comes from the village of Yomitanson. Supplied to the Ryuku Kingdom government 600 years ago, it features colorful thread patterns woven onto a plain background. The patterns come in three basic designs: Jinbana, a circular pattern representing money; Kajimaya, an X-shaped pattern symbolizing longevity; and Ojiban, a triangle-shaped pattern representing prosperity for descendants. The art of making the fabric nearly died out but is now kept alive by180 villagers in three locations in and around Yomitanson village. Sada Yonamine, the leader of the effort to revive the art, was designated a national living treasure in 1991. The Kariyushi is an Okinawan-style shirt, It has no collar and has patterns and stripes running from the shoulder to the bottom of the shirt on one side. It is not tucked in. Ramie cloth is a fabric woven from the fibers of an indigenous plant in the nettle family. The most beautiful pieces are decorated with designs of natural colors made using the ikat technique. Ikat designs are made from yarns tightly bound together to keep the dye from penetrating and then woven together on a loom, with a blend of dyed and undyed yarns, producing wonderfully blurred patterns. Among the natural colors are blue from indigo, vivid yellows from the fukugi tree, pinks and reds from sappanwood and safflower. The finest ramie cloth has traditionally come from the outer islands. From the early 17th century ramie cloth made in the Yaeyama Islands was highly valued in China and Japan and was used as an important trade item and payment for taxes. Cloth made in historical times featured delicate ikat designs and bold colors from natural dyes. Ikat techniques and natural dyes were abandoned in the early 20th century and have been brought back in recent times. Ikat is also used to produce wonderful patterns on silk kimonos and other garments. Bashofu is cloth made from fibers taken from the leafstalks of the banana fiber tree, a plant that is a relative of plants that produce edible bananas. It quality depends on the thinness of the fibers and how tightly they are woven. The best quality is fibers are lustrous and easy to mistake for silk. Banana fiber trees grow wild and can be cultivated. Most likely introduced from Southeast Asia, they are treelike plant that are used to provide windbreaks and shade as well as fiber. The fiber is harvested from mature trees. It is stripped from the sheath-like leafstalks, and sorted into piles used to make fine, medium and coarse cloth. The strips of fiber are boiled with ash to soften them up. The pulpy part is scraped off and the remaining ribbons of fiber are arduously split into fine strands and then tied from end to end to form one continuous yarn. This task has traditionally been done by old women whose poor eyesight prevented them from doing actual weaving. Bashofu is decorated with ikat patterns. some of the best quality cloth is sold for $15,000. On the Yaeyama Islands women wear robes made from fiber banana cloth with ropes of twisted straw. Okinawa is the home of the traditional form of karate, which was given some attention in the Karate Kid series of movies. One 90-year-old karate master told Zich, "The Japanese believe that he who attacks first will be the winner---like Pearl Harbor. Not in Okinawa. The philosophy of karate involves shin, gi and tai---heart, technique, and body. Karate's true value lies within the heart---in concentration, endurance, self-control, and, most important, modesty of mind. 'Nuchidu takara---Life is the most precious thing.' It's something we often say in daily life." Okinawan tug of wars are feature entire villages battling each other on either end of a 16 ton rope. Bull against bull fights are also common on the island. The bulls legs are strengthened by walking them through the sand. Their necks are strengthened by pushing them against a truck tire tied to a tree. In one survey in 1995, 46 percent of the respondents in Okinawa and the Ryukyu Islands called themselves Ryukyu islanders, 31 percent regarded themselves as Ryukyu islanders and Japanese. Only 12 percent viewed themselves as Japanese. One Okinawan historian told the Washington Post, "Before the war, there was a strong current of assimilation [with Japan] and Okinawans felt their culture was inferior. But in the 1980s, there was a search for our cultural identity. Okinawans are now proud. They realize it's okay to be 'Okinawan Japanese,' to be different." Okinawans are discriminated against by mainlanders. They refer to people from the mainland as Yamato. They complain mainland Japanese think they speak English, are "half Filipino" and are poor and ignorant. Many Okinawans regret the Japanese takeover of the island because they had more autonomy under the Americans.